During July, August, and September, I ran 218.29 miles. I've passed all of my running goals for the year except for the 600-mile mark, which I'll pass this weekend. I ran in four events, 2 10Ks, a 4-Mile, and an 8K in Nampa, Idaho. I'm running about as well as I have since high school, which is to say I'm still at the back of the pack but more assertively so. And I'm enjoying it. And I registered for a half-marathon in December. Orange represents the months just past; Red represents a long run made in the new and possibly final color on October 1. Not that I expect to sweep the map by December 31; we're moving into mopping-up operations now, but mopping up is going to take quite some time. 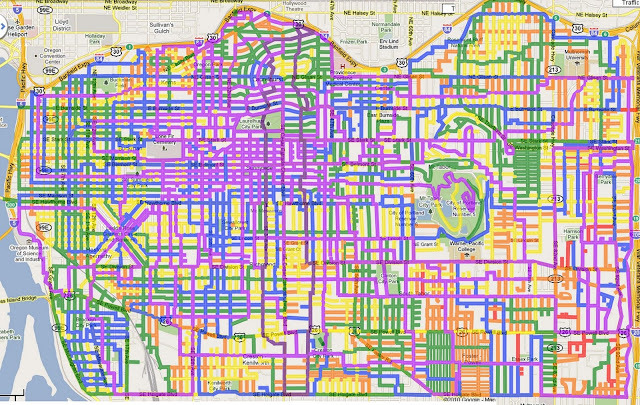 You can see from the red line that I have to do a lot of running on already-colored streets to get to fresh ones. The amount of new color that will be going onto the map from here on out is so modest that I'm not sure another change of hue would even be noticeable. Besides which, I'm out of spectrum. Just for fun, I made a similar map of my hometown, which is fairly wee and can be picked off over the course of a few visits. As a joke with myself, I went on to make similar maps of Lakeview and Baker City, Oregon, two towns I had occasion to run in; in neither case, however, is there any particular reason to think I'll ever put a second line on the map. Only164.94 miles for the quarter. I'm maybe just not a cycling guy at this point in my life. (1) Ride 1000 miles this year. Without radical and unforeseen life changes, this will not happen. (2) Have "all-time" minima of at least 10 miles for every day of the month. In the prime biking season just ended, I pushed exactly one of the ten remaining months over this goal. It's exceedingly unlikely that I will achieve anything more on this one. (3) Set new records for monthly mileage for at least nine months this year. I would have to set new records for each of the three remaining months. This is very doable. I've been very bad about the garden. It has fallen victim not only to the time I spend on this blog, but to my increasing time spent running. I remain fully addicted; it is not a lifestyle change I am focused on. I remain plateaued, as I have been for quite some time, at just barely under 200 pounds. I have only barely, barely, barely just started attending the new gym I joined back in late spring. My upper body is grossly underdeveloped relative to my lower body, and whereas I can run 10 miles without too much trouble now, a tour of the gym machines leaves me hobbled for two days. Some focus there, as well as erratic but improving attention to nutrition and portion control, might help me get back to trimming down a bit. I'll do your cycling if you do my running. If I do my new commute 4 days a week I will hit 1000 miles in approximately 14 weeks. I think an interesting visualization would be a "heatmap" where every time you run a street, you change the hue to a hotter color. The tomato thing seems too easy. I think you ought to start having encounters with tomatos instead. Nichim -- In Vermont? In December? Ezra -- If you code it, I will use it. Jenners -- I don't really think discussion of my intimate life is appropriate here.